The KMAT is a state -level entrance examination to get the admission in post graduate courses which is offered by management institutes in Karnataka. To get the admission in MBA, MCA and PGDM courses applicants can apply for this examination. This test is conducted by the Karnataka Private Post Graduate College Association (KPPGCA). By giving the (KMAT) test you can be selected in AICTE approved university affiliated B- schools in Karnataka and Bangalore. The KMAT will be held in more than 10 cities all across the country and candidates may apply from all over India and abroad. Read on KMAT Exam Pattern 2017 beneath to increase your chances of getting success in this entrance test. The KMAT 2017 is a perfect Entranceway to get the admission in India’s best institutes in Bangalore and Karnataka. As Bangalore and Karnataka are called Silicon Valley of India and no.1 job Terminal in India so if you want to be one of the chosen to grab this opportunity don’t let this chance slip from your hand. The online application form will be available from 20th May 2017. The exam will be held on 30th July 2017. This test is a paper-pen based test with 120 Multiple Type Questions which are divided into three sections. The applicants who wish to appear in the KMAT have to gear up for the regarding subjects as Aptitude, Language Comprehension Skills and Basic maths. For preparation, candidates can attempt the competitive entrance exams which are available on the many websites. The eligibility for KMAT 2017 into professional courses in Karnataka is followed as per the UGC guidelines. Any bachelor’s degree with minimum 50% marks. Applicants should have done 12th with maths. Bachelor’s degrees with three-year duration having 50% marks (45% for SC/ST students) applicants who are appearing in their final year of bachelor’s degree are also eligible. So don’t think too much grab this opportunity before it’s gone. Some people are having a question in their minds and it is "Is the exam pattern for MCA and MBA for KMAT same" and the answer to this question is 'Yes' because total questions that are included in both admission test are 120 and are divided into 3 sections. Each section is of 40 marks (40+40+40 = 120). 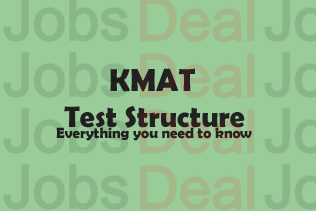 You may even follow the "Test Structure" link below to find more of KMAT Exam Pattern 2017. What is more, you can share this article with your friends!